Sweet and tender roasted carrots in a tasty maple dijon glaze. Today I have a tasty and super easy side dish for you that is perfect for Easter, or any other dinner for that matter, some maple dijon roasted carrots. 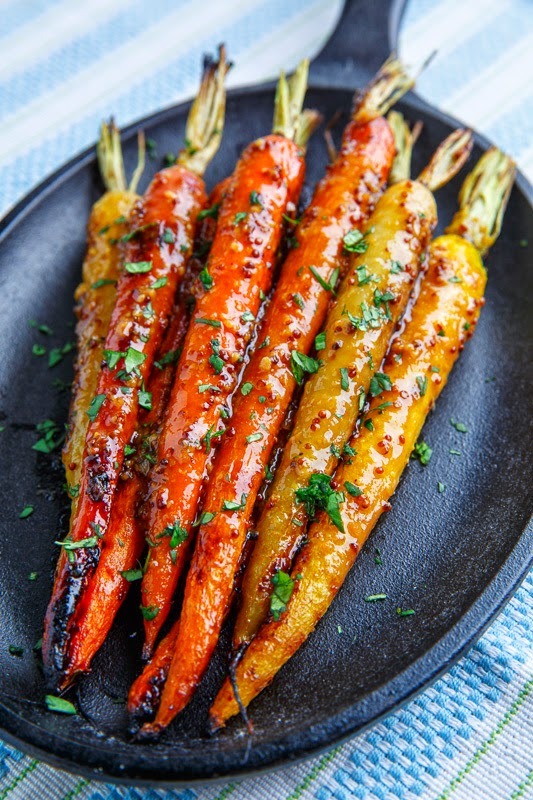 This isn’t your average maple dijon glaze as I have kicked it up with the addition of garlic, soy sauce, rice vinegar and miso which really creates a beautiful blend of flavours that would be perfect on just about anything and in particular these tender roasted carrots! 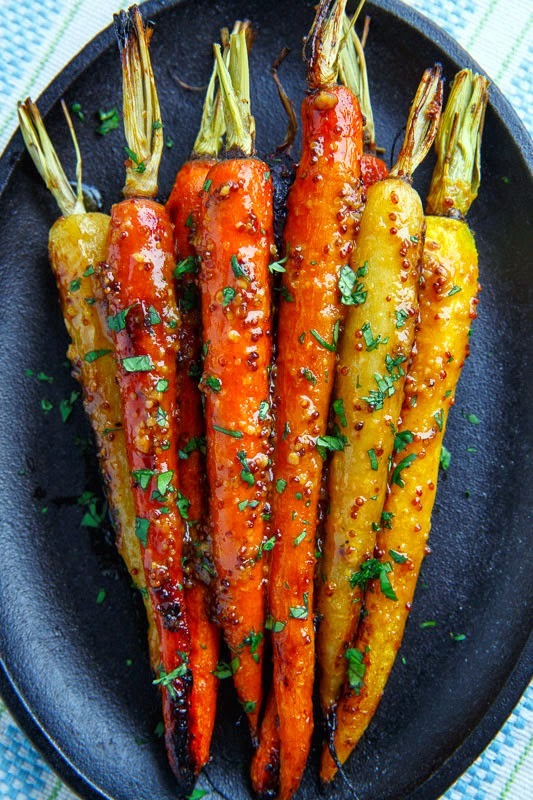 It requires very little active effort to make this side dish, you simply clean the carrots, mix the glaze, toss the carrot in the glaze and roast until tender. That’s less than 5 minutes of active time to create a fabulous side dish for your meal! 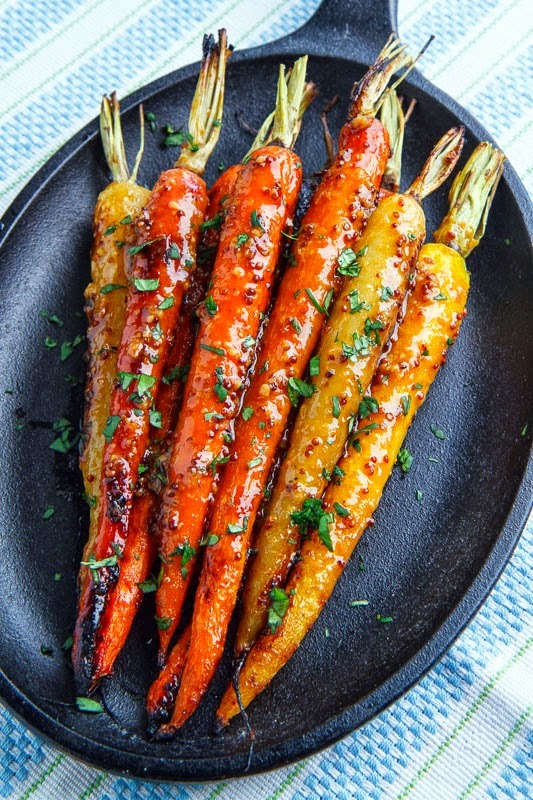 I like to toss the carrots in the glaze both before roasting and after so that you get that nice caramelized glaze from the roasting and the fresh glaze to brighten the flavour. If you are looking for a side dish for your Easter meal you can’t go wrong with these maple dijon roasted carrots! Just look at that amazing glistening maple dijon glaze. Roasted whole carrots are so pretty, love the dijon in this! Kevin, I can't get over this AMAZING flavor combination!!!! Trying this!!! these carrots are gorgeous! Happy Friday!!!! This dish is gorgeous! The colors are stunning! And I'm a huge fan of roasted carrots, so I know I would love this. This recipe sounds amazing and the photos make my mouth water. This could be a side at our Easter dinner. Dijon is amazing with roasted vegetables and im loving the array of colors with the carrots. Very well done! Really pretty Kevin! I bet they would be awesome with that Salmon from earlier this week! My nan use to make these carrots nearly every Saturday! And I must say, these look delicious! These are absolutely gorgeous!! LOVE that glaze. These look beautiful, and sound absolutely delicious! I don't have miso paste. Would these turn out good without that? Or is there some sub I could use for it? Great recipe! I have carrot roasting plans for tonight and will be following your lead! kelly: I'm glad you enjoyed them! Very tasty Kevin! Had the whole family over for dinner and everyone really enjoyed them. It made a nice presentation too! Pretty easy to make with little fuss. I lined my baking sheet with aluminum foil, sprayed it with non-stick spray and it made for an easy clean up. I did double the glaze, because I just wanted to pull them out, flip them over and spoon the second step of glaze over them for convenience. I will definitely be making these again. Thank you for a tasty way to experience carrots! How long will sauce keep if I make it ahead? These look amazing, but I don't have maple syrup. I have honey. Do you think that would work? I really want to make these for Easter dinner. These carrots are amazing! Made them for Easter but they will definitely become a regular side dish here in my vegetarian home! We have made these several times. There GREAT !!!! Kerri Troyan: Vegetable oil is good. I avoid refined oils in my diet. Would replacing the oil with water work in this recipe? Or do you have a different suggestion such as using more of another liquid ingredient? Unknown: The oil is kind of essential here for the roasting but you can remove the oil from the part that you toss the carrots in after roasting. Rachel E: The herb is parsley. Can you make these 1 day ahead? How do they taste reheated? Maria guasta: They are best the day made but you can make them a day ahead and they are good! What is sprinkled over the carrots? Parsley? I don’t see it listed in the ingredients or the instructions. That is a parsley garnish that adds to the presentation! Enjoy! I’ve made these several times…..delish!!! It was requested that I bring them to Thanksgiving this year. I couldn’t find any young rainbow carrots – had to get full size (Adult?) rainbow carrots instead. 🤞🏼🤞🏼 They they are just as good!! Awesome job of curating and creating! I always look forward to seeing what you’ve got.